Our popular contributor Kara-Leah is committed to regular home practice and believes if everyone had a home yoga practice – whether it was asana, pranayama, meditation, chanting or Karma Yoga – it could revolutionise our society. Ok, as you’ve likely guessed by now, I’m obsessed with home yoga practice. Part of that is because it’s been so incredibly healing for me in my own life. I see how healing it is for other people too. And finally, I’ve written a book that’s all about home yoga practice so the more people that realise its importance, the more books I might sell. Now, more than ever, this world needs more people who are capable of taking care of themselves. We need people to take responsibility for themselves and their well-being – for their own mental health issues, their own physical health issues and their own emotional health issues. 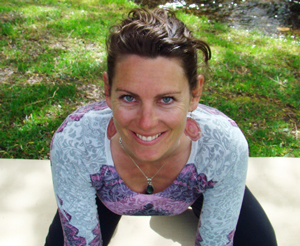 Daily yoga practice helped me heal and manage major chronic spinal issues. Daily yoga practice helped me recover from psychosis. Daily yoga practice helped me break free of co-dependent relationship. It’s helped me figure out my life, myself, this world and my place in the world. I didn’t do this all on my own – I’ve had plenty of help along the way from professionals, medication when necessary, friends and family. But my daily yoga practice has been the bedrock, the foundation, and the cornerstone of my recovery, healing and insights. If 10% of the population had a regular home yoga practice, we could address some of the major issues facing society today. Off the top of my head, here’s five major issues costing our country millions of dollars. All of these issues would be positively impacted if more people practiced yoga on a daily basis. When you commit to practicing yoga on a regular basis, you are taking responsibility for yourself as a human being. You are saying that you care about your health and well-being and that you are worth taking care of. When you start to take care of yourself and send that message that you’re worth something, the way you interact with the world starts to change. Not only does your mental, emotional, physical and spiritual well-being (in general) improve, but because you feel better about yourself and you are beginning to realise your own intrinsic sense of value, you make better choices in your life. You’re able to deal with your emotions and mind better. You no longer need the drugs or the alcohol or the lousy relationship. Knowing you’re worth something changes everything. Plus when you practice yoga on a regular basis you become more aware. You begin to see the truth of yourself as a person and you begin to see the truth of your choices. Even realising that you do have choices can be a huge step. Realising you have choices is the first step to making different choices. Those different choices can be the difference between going back to prison and having the courage to step into a new life. Taking responsibility for your well-being and becoming aware of the importance of your choices means that you are far more likely to live well into your old age, which means less chance of needing aged care. Yogis are famed for choosing the moment when they leave this lifetime – for sitting down in meditation and going out in bliss. Most of us are unlikely to exit that way. But without yoga, many of us will see out our twilight years in an aged care facility, being feed and toileted by an underpaid overworked carer doing the best they can. Practicing yoga won’t guarantee perfect health, but it does increase your chances of better health. Better health means you can keep walking, stay independent and stay in control for much longer – maybe right until the end. I know this is true. But I don’t expect you to just believe me. I want you to try it out. I want you to practice yoga daily for forty days and see if it makes your life better. I know this is hard, but I’ve done it, time and time again. So I’ve taken the process that has helped me stick to regular yoga practice, all the tips and tricks I’ve learned along the way, and I’ve put it into a workbook to take you through a process so you can commit to forty days of yoga. I want you to do those forty days. And then I want you to tell me what the experience was like for you. Does it make life better? It certainly did for one of my beta-readers, Sara Foley. Now imagine, if you buy this book and do this process, and practice yoga for forty days – you now know it works. If it works for you, could it work for other people you know? Could it work for society as a whole? I know we can’t make people practice yoga. But what we can do, collectively as a community, is help each other practice yoga on a regular basis and then share our experience with the people around us. As teachers, that means encouraging and supporting our students into a home practice. It also means cultivating and tending our own home practice. As students, it means having the courage to take that first step and begin practicing yoga at home. It means being curious about the experience. Paying attention to how we feel, what we think and what we experience. And then noting how this changes over time. For all of us, it means talking to other people about our experiences, and sharing how yoga makes our life better. And that’s exactly why I’m always going on about home yoga practice. I believe in it and I believe in the difference it can make for our society overall. What about you? Do you practice yoga at home regularly? Does it make a difference in your world? She’s the publisher of The Yoga Lunchbox and published her first book, Forty Days of Yoga – Breaking down the barriers to a home yoga practice in 2013 and she’s almost finished revisions for her second book, The No-More-Excuses Guide to Yoga. She’s also a regular contributor to the Elephant Journal.